This summer the fashion fanatics of the world are again desperate to get into new ideas. Fashion is rapidly moving forward. Those of you who are die-hard fashionistas will find joy about the change in details. You will need to look ahead and be with it and understand what to look for. You will need to be clever to be ahead of the pack. There is a transition season to season and you must be a smart chooser. The past winter, things were already getting more draped and layered. It is only natural that come summer add to that floats, flowers and a great more drapes. Thus there is a bridge between the seasons and you can slowly work toward a more exaggerated look. The key is to take into account the designer shapes, which gently follow a pattern before it hits high street prêt lines. It is clear that the colour this summer will turn candy sweet. The collections seem to take inspirations from bonbons and summer sorbets. Fruity and sweet, the fashion followers will get a sugary rush. The colours are not the pastel hues that you generally associate with cool summer shades; rather, they are primary, clean and fresh. Lemon drop yellow, candyfloss pink, honeydew green, watermelon red and so on. There is an excessive humid heat so you may want to notch the colours down a level. You would want to reflect, not absorb heat. This summer we are looking back at the 70's with a great deal of gusto and aplomb. The style was free flowing, easy and without fuss. The trendy styles of all those women who loved Woodstock and flower power are back with authority. This time around, the fabrics are softer, giving greater comfort and stupendous, eclectic luxury. The kaftan hems are wide, gathered in layers and pleated to give it structure. Halter is big and so is sleeveless, crew necked or off the shoulder, the styles can be easily translated to kameez. The bohemian look is grand with sweeping dresses. Patchwork prints, ikat, batik, and floral prints are big going forward. Single or layered Bohemian styles can be dressed up or down. Shift or kaftan tops with draw string ties are good options this summer. Neckpieces are turning big and so are the wrist cuffs. Slippers are flat with ankle ties. Details are a key with tie and dye, macramé, crochet and retro prints making a clear comeback. Floral prints can be a riot or it can get softly sprinkled. It can get so many renditions that you will be surprised. They can be in full bloom or graphically bold. This summer you can find them being used in various ways. 3D applications engineered on a blouse or embroidered poppy buds, large burst of blossoms or chic gardens as borders can all look spectacular. Delicate or daring floral will be a winning story this summer. In traditional suit or in a sari, pick print that has floral elements. In a suit, floral scarves and churidars paired with candy-striped shirt will look fantastic. In a sari, a floral end piece with or without a border can be charming; a wide floral border on a solid ground may just be a stunner. Shine is back. Sequins for day wear will be sparkling bright. Don't use it sparingly and shy away from the dazzle. This summer it is acceptable to show your bling in the sun. With juicy, scrumptious colours, use focal pieces instead of going for the entire outfit and pair them with simple neutrals. You can wear a jazzy blouse with a muted sari. Try earthy accessories, like wood or shell, cane or python texture. It will add character to your ensemble. Summer is the time to take some time off. Take a holiday or a break. Razzle and tango to a new beat. Try new shapes, it is curative for your soul. Our lifestyle calls for such homogeny that we do need to make an effort to feel fanciful and glorious. Ensemble: Dressy Dale. 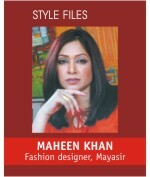 Special thanks to Maya Rahman of Dressy Dale for arranging an exclusive summer photo shoot for Star Lifestyle.